Most of you might not know this (I didn't) so no harm in sharing. 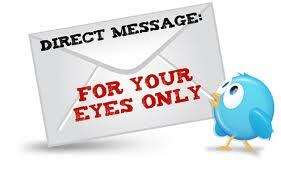 We know that when you send an Email or a Message and you deleted the sent item still the recipient can read it. However, unlike regular Email system and other Social networks, twitter in the contraray, keeps one copy of the message for performance issues. So when you send a DM or a tweet, a unique id get assigned to this tweet. The recipient only get notified that he got a tweet with this id. The rest is database relations. Now when you delete the tweet the Id is gone, the database cascade deletion get triggered and delete all the occurrences of this id from all tables. So when you sent a message you can still delete it before the other party read it, and of course the opposite is true, when you find your DMs are decreasing. Someone is deleting messages sent to you. In Outlook there is a Re-Call option to do just that, but again the recipient should approve that. Thanks to our smart Geek @Naseeeee for discovering this. Are you sure? Because I'm pretty sure I get emails with the full text of the direct message and emails are impossible to revoke. You are absolutely right, those emails are impossible to delete and you can see them. I was talking about the actual Twitter DMs in your inbox. Hi - do you know if this has changed with New Twitter? Ah - never mind. Found the information here: http://support.twitter.com/articles/219981 and the answer is still yes. Thanks!